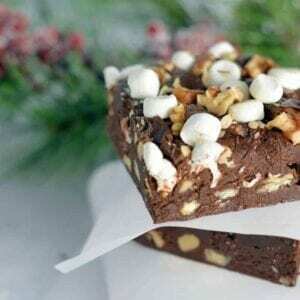 Quick 10-Minute Rocky Road Fudge is the perfect holiday dessert and will complement any cookie tray! Chocolate, marshmallows and walnuts! Line an 8x8 or 9x9 square pan with parchment paper and coat with cooking spray. In a microwave safe bowl, combine sweetened condensed milk and semi-sweet chocolate chips. Microwave on high for 5 minutes. Remove and whisk vigorously, add vanilla. If there are still small chunks, return to microwave for 30 seconds, stirring between. Fold in walnuts and spread into baking pan while still hot. Top with marshmallows, press down lightly into fudge mixture. Place in the refrigerator to set. Cut and serve!